KIRKLAND, Wash., April 16, 2019 – The redesigned PACCAR Powertrain website aids Kenworth customers in their search for the latest product information on PACCAR engines, PACCAR transmissions, and PACCAR axles. 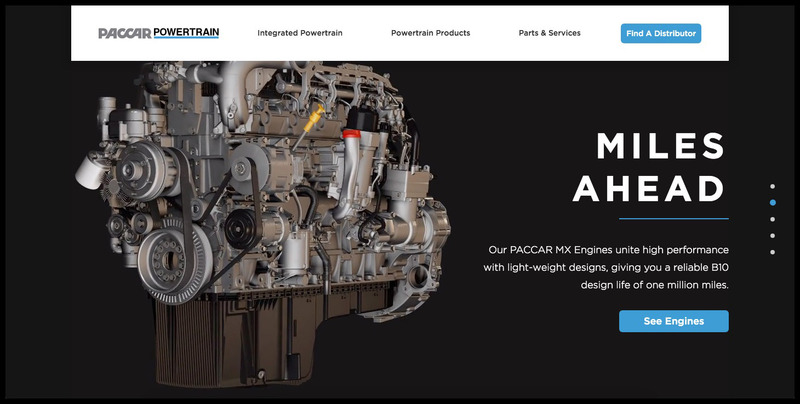 The website features new engine and powertrain videos, and updated literature supported by enhanced navigation and mobile-responsive design to provide seamless access on any device. The integrated PACCAR Powertrain, which includes the PACCAR MX engine, PACCAR 12-speed automated transmission, and PACCAR 40K tandem rear axles, is engineered to optimize performance to maximize the value provided to fleets and truck operators. The 12.9-liter PACCAR MX-13 engine is rated up to 510 hp and 1,850 lb-ft of torque, and combines efficiency and flexibility for a high-performance solution. The 10.8-liter PACCAR MX-11 engine, which is rated up to 430 hp and 1,650 lb-ft of torque, delivers superior performance in a lightweight design. The PACCAR MX engine series has an industry-leading B10 design life of one million miles in line haul applications, which means 90 percent of PACCAR MX engines will log one million miles without a major overhaul. The PACCAR PX-9 and PACCAR PX-7 power Kenworth’s medium duty conventionals and cabovers. The PACCAR PX-9 engine provides one of the highest power-to-weight ratios in its size, and is rated up to 450 hp and 1,250 lb-ft of torque. The PACCAR PX-7 delivers smooth operation and an excellent power-to-weight ratio with ratings of up to 360 hp and 800 lb-ft of torque. The PACCAR 12-speed automated transmission is ideal for linehaul and regional haul applications up to 110,000 lbs. gross vehicle weight. The transmission is up to 105 lbs. lighter than comparable transmissions, allowing for greater payloads. The PACCAR transmission also offers the best overall gear ratio coverage and provides excellent low-speed maneuverability. The proprietary PACCAR 40K tandem rear axles, which are the industry’s lightest and most efficient in their class, complement the superior performance and fuel economy of PACCAR MX engines. Designed to improve the operating efficiency for line haul, regional haul and pick-up and delivery customers, the axle is rated at 40,000 pounds and supports a gross combination weight of up to 80,000 pounds. The PACCAR front steer axle delivers a lightweight, durable option to enhance customer vehicle payload. Available with weight ratings of 20,000 pounds and 22,000 pounds, the front axle is designed for demanding applications such as construction, heavy haul, refuse, and other vocational uses. PACCAR offers a world-class base warranty of 2 years/250,000 miles and 5-year/750,000 miles for major components on PACCAR MX engines, and 5-year/750,000 miles for both the PACCAR transmission and PACCAR’s 20K front and 40K rear axles. For more information, visit the PACCAR Powertrain website at: www.PACCARPowertrain.com.